The New Packaging Act – Why? The main objective of the Packaging Act is to strengthen recycling and competition. Consequently, the new act is clearly committed to high ecological standards in the areas of collection and recycling of packaging waste in combination with a fair competition between the dual systems. The regulations are designed to ensure a lawful conduct of all market participants. This main objective addresses not only the dual systems but also manufacturers and retailers, in order to ensure that all obligated quantities to be licensed are participated in the dual system. Basically, the duty of system participation obliged packaging remains for all firstly distributed sales packaging, which generates waste at households or equivalent sources of waste generation. What is new is that repackaging, according to the Packaging Act, is also obligated. However, this eliminates the redemption obligation which was previously provided in § 5 of the Packaging Ordinance in the event that the end-user refuses to take it. Shipment packaging is now considered to be sales packaging and not service packaging any more. The licensing of shipment packaging can therefore no longer be delegated to pre-distributors. In addition, beverage carton packaging is explicitly named as a fraction in the new Packaging Act. The content must be intended for consumption as a drink. If cardboard composites do not contain beverages, they are to be considered as other composites according to the Packaging Act. Due to breakage or spoilage, packaging may not arrive at the end-user. For these amounts of system participation obliged packaging, the license fee can be reclaimed in cases the packaging was recycled by the manufacturer. However, this only applies if the return and recovery has been documented in a verifiable form. Please notice, these self-managed quantities must also be included in the Completeness Statement. The authorized Central Agency is the new control body and it is already working. It is funded as a foundation by the dual systems and industry solution operators according to market share. Since August 2018, manufacturers and retailers are able to register with the Central Agency. This is necessary because according to the Packaging Act first distributors must already be registered before they can license their packaging in a dual system or before they place packaged goods on the market. Therefore manufacturers and retailers have to register already in 2018. 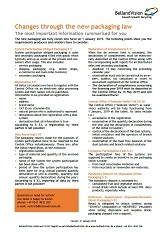 Manufacturers, retailers and importers who do not have to submit a Completeness Statement must also register. The registration will be published in the Internet. This makes it verifiable to the public which distributors comply with their reporting obligations under the Packaging Act. 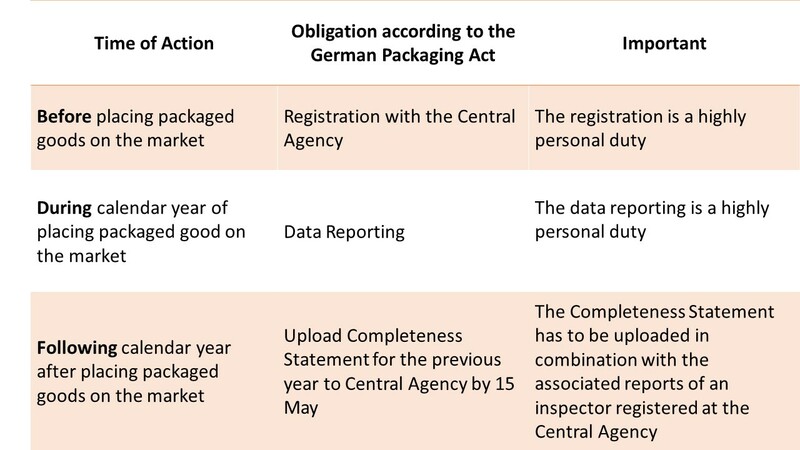 In addition to the registration, from 2019 onwards the acceptance of Completeness Statements as well as the volume flow of dual systems and the market share calculation will be the competences of the Central Agency. 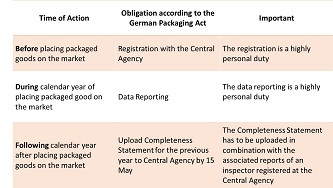 The Central Agency as a single addressee for all reporting done by market participant’s increases transparency in the field of packaging licensing. The Central Agency will examine and crosscheck all submitted reports. In case violations are detected, the enforcement authorities are involved. This will allow the Central Agency to ensure fair competition and lawful conduct on the part of the obligated market participants. In the first step, the recycling rates will be raised on 1 January 2019. The previous material-specific rates will be supplemented by a rate for beverage cartons. In addition, a recycling rate based on the total amount of lightweight packaging collected is added. The new quotas can be found in the diagram below. 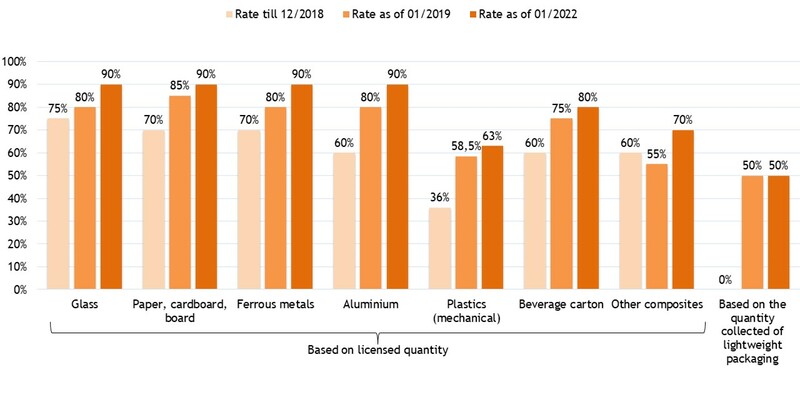 The material-specific rates will be raised again on 1 January 2022. All rates are reviewed by the federal Government within three years of the last increase. The federal government maintains the right to then increase the rates again. With these new prerogatives, the public waste disposal companies can make on the one hand significantly more specifications. On the other hand the dual systems have to bear the costs. As of 2019 not only the public waste management authorities will be responsible for the public information about waste separation. A service which has already been financed by the dual systems in the past. In future, the dual systems must assume in addition increased responsibilities in the public information. This information should include the purpose of the separate collection of packaging waste, the corresponding collection systems and the recycling results. The system operators should inform regularly and locally as well as nationally. In the context of the license fee incentives for sustainable packaging design should be set up. On the one hand packaging should be designed so that it can be recycled well. On the other hand, it should contain as much recyclates as possible or be made from renewable raw materials. The dual system operator have to report yearly to the Central Agency how these incentives were set. In case the report is approved, both the system operator as well as the first distributor can publish the report as an evidence of the sustainability commitment. From 1 January 2019 retailers, including the mail-order business, will be obligated to point out disposable and reusable beverage packaging with clearly visible signs. A mandatory quota of reusable beverage packaging is not required. In addition, according to the Packaging Act, special kinds of carbonated fruit and vegetable juices (“Nektar”) are required to bear a deposit. Do you still have questions that we have not answered yet?